Have you spent hours trying to get control over your ever growing photo collection? Wondering how to bring it all together from different folders and different machines and phones? Frustrated that you can see dupes after dupes and yet struggle to find the picture you need when you need it? That's exactly the problem we are attempting to solve with the Tru organizer. Tru 1.0 is live and ready to roll - it's designed to be dead easy because we believe anything that is not easy is not useful. So Tru is super easy. Tru is also super fast - and more importantly automatic. You tell Tru what it needs to know and it does the rest without you having to sit and stare at it and watch for errors. None of that. Tru is truly effortless. 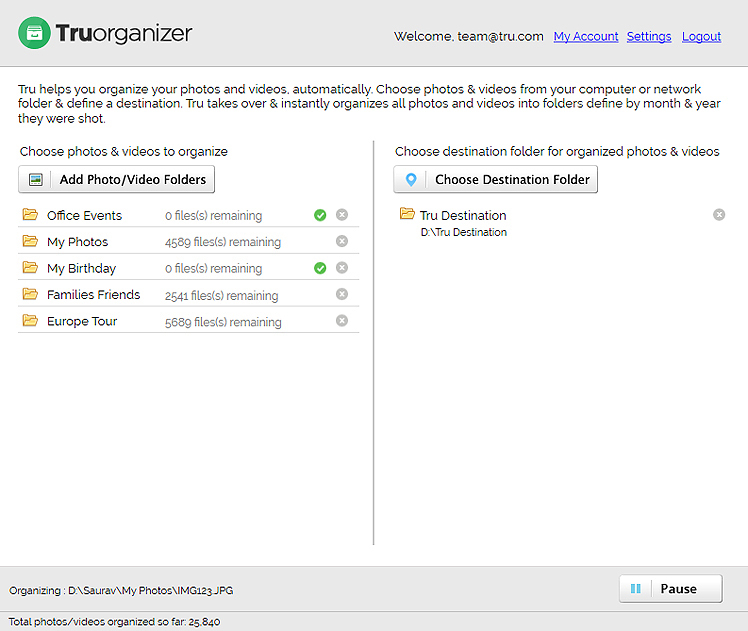 Tru 1.0 is aimed to do just one thing - bring all your photos into one single folder, de-dupe them and organize them in MONTH/YEAR folders so all your photos are systematically put into different folders based on the month-year they were clicked. You simply connect all the folders where your photos are and Tru does the rest. Tru is so easy you'd wonder why and how! Now we want to know if it truly solves your problem and how we can improve it. Please share your feedback and suggestion via email at tru@picbackman.com.